Explanation: After a long solar minimum, the Sun is no longer so quiet. 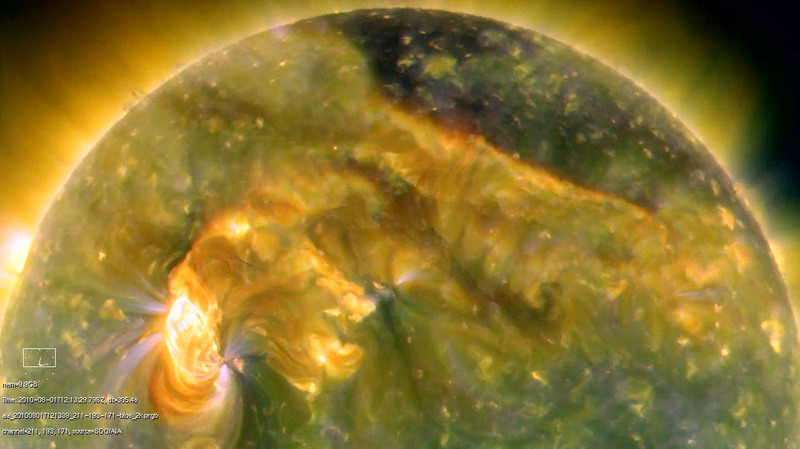 On August 1, this extreme ultraviolet snapshot of the Sun from the Solar Dynamics Observatory captured a complex burst of activity playing across the Sun's northern hemisphere. The false-colour image shows the hot solar plasma at temperatures ranging from 1 to 2 million kelvins. Along with the erupting filaments and prominences, a small(!) solar flare spawned in the active region at the left was accompanied by a coronal mass ejection (CME), a billion-ton cloud of energetic particles headed for planet Earth. Making the 93 million mile trip in only two days, the CME impacted Earth's magnetosphere, triggering a geomagnetic storm and both northern and southern auroral displays.